Disclosure: This post has absolutely nothing to do with baking, but it does contain info about food, so it’s not too far off topic. As you may or may not know, I am all about learning and adapting when it comes to healthy food and lifestyle. I recently noticed a few brown spots on my nose, and stopped into an Organic Skin care shop on the highstreet when I was in London last month to get their advice. The clerk so kindly recommended a papaya mask, which she explained would naturally lighten the spots and moisturize my skin. Unfortunately I did not budget £50 for a few ounces of this miracle potion. So I went home and researched ways to create my own papaya mask. Papayas are one of the few fruits that are available all year round, and they are very inexpensive as well. Boasting benefits such as carotene, potassium,vitamin A, vitamin C, essential minerals, Papaya also helps prevents premature aging, has anti-inflammatory properties, and anti-cancerous properties. All this for just a few measly dollars? SIGN ME UP! 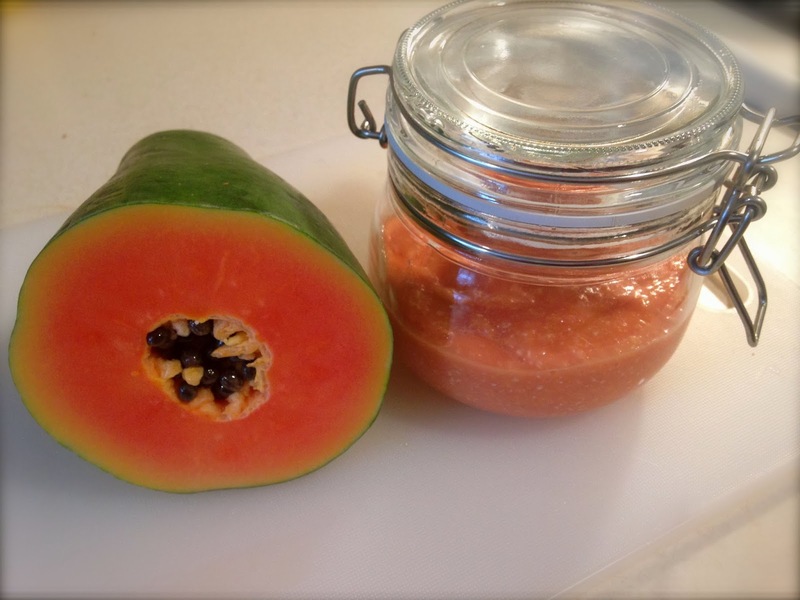 It takes literally 5 minutes to whip up a papaya face mask, and at the same time you can make yourself a smoothie or a hair mask! Whizz everything up in a blender, apply to face for 15-20 minutes, then rinse off. My face has never been softer, and my skin looked instantly brighter and dare I say, more youthful. I know the brown spots will take some time to fade, but I have no doubt that they will. Papaya also works wonders for split ends and dry hair. I tried this mask on my hair and the results were incredible! So shiny and ridiculously soft! Whizz in blender, comb through hair and leave on for 30 minutes, rinse and enjoy your shiny locks for pennies compared to salon masks! You can find other masks here, and here, or experiment with your own recipe by adding vitamin E, aloe, or cucumber. Let me know how you get on!